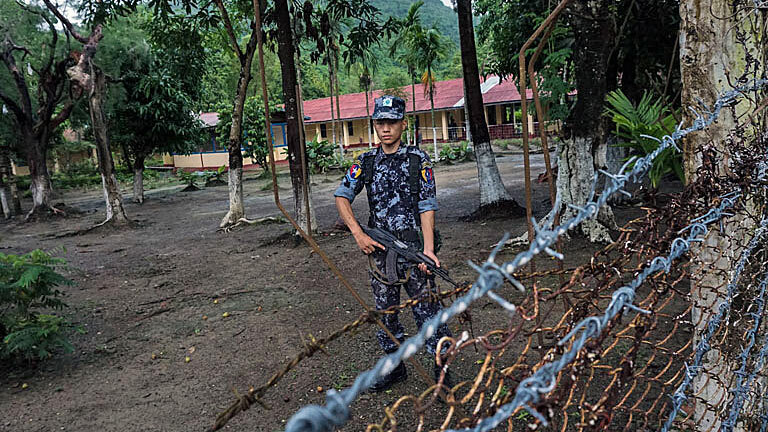 A border policeman stands guard at the Kyikanpyin border station's command center in Maungdaw township, western Myanmar's Rakhine state, July 14, 2017. Attackers in the northern part of Myanmar’s Rakhine state have shot dead six farmers, while two others have gone missing in the latest violent incident to plague volatile Maungdaw township, a local official and the office of State Counselor Aung San Suu Kyi said on Thursday. Tin Maung Swe, secretary of the Rakhine state government, told RFA’s Myanmar Service that the eight farmers, all from the small Myo ethnic minority group in Maungdaw’s Kinegyi village, who went to their farms to work at about 8 a.m.
Han Nine, the father of one of the murdered farmers, said he heard about 10 shots about an hour later as he headed to the farm, and later found two dead bodies and a wounded woman, according to the official. The State Counselor's Office later reported that six of the eight farmers were found dead, while two remained missing. Border guards are searching for those who are missing, Tin Maung Swe said. He also said government soldiers from Infantry Unit 380 and border guards are performing security clearance operations in the area. Kinegyi village has about 50 households, and its residents are all Myo, a sub-ethnic group of the state’s ethnic Rakhine people, he said. The village was burned during communal violence between Rohingya Muslims and ethnic Rakhine Buddhists in 2012 that left more than 200 people dead and displaced about 140,000 Rohingya who were then placed in internally displaced persons camps. Myanmar considers the Rohingya illegal immigrants from Bangladesh and has denied them citizenship as well as access to basic services such as jobs, education, and health care. Maungdaw and two other townships in northern Rakhine state — Buthidaung and Rathedaung — have been in a state of upheaval since deadly attacks on three border guard stations in October 2016 blamed on a group of Rohingya militants. As a result, Myanmar security forces conducted a violent four-month sweep of the region during which an estimated 1,000 people were killed and about 90,000 Rohingya fled, with most going across the border to neighboring Bangladesh. A United Nations fact-finding mission has been tasked with investigating atrocities that the country’s army is said to have committed against the Rohingya during the crackdown in northern Rakhine, though the Myanmar government has rejected the decision and ordered that visas be denied to the commissioners. Security forces continue to patrol the tri-township area where disappearances, murders, attacks on security forces, and periodic killings by troops continue to occur. Since June, they have reported finding “terrorist” training sites, tunnels, weapons, and food supplies along the Mayu mountain range in the Maungdaw-Buthidaung township area.